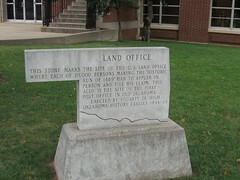 With the opening of the approximately two million acres of "Oklahoma Country" for homestead settlement at 12 noon Monday, April 22, 1889, thousands of settlers rushed to claim free land. Those making claims were required by law to register at one of two U. S. Government Offices, one located at Kingfisher and one at Guthrie. The modest 18 x 30 feet false fronted frame building of the U. S. Land Office stood alone that day, capping the hill east of the railroad station. Almost immediately, it was surrounded by hundreds of eager settlers, attempting to register claims. By nightfall, it stood in a sea of tents that collectively made up Guthrie. The Kansas City Gazette of April 23 reported; "The crowd around the land office is too great to be numbered. Those who did not get to file their claims last night slept where they were in line to be on hand this morning." The Land Office continued it's "land office business" rush for weeks as the thousands of homesteaders filed claims and counterclaims for free land. Lines of claimants crowded "Hell's Half Acre" outside the Office. Land Office Register John Dillie of Huntington, Ind. and Receiver Casius Barnes of Fayetteville, Ark., who became the 5th territorial governor in 1897 worked all day and late into the night on many occasions. 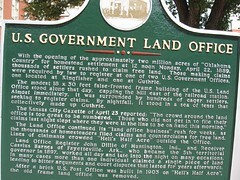 In many cases more than one individual claimed a single piece of land, leading to bitter arguments and court disputes that lasted for years afterwards. 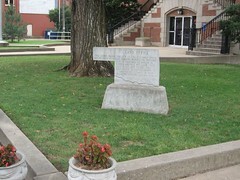 After a brick U. S. Post office was built in 1903 on "Hell's Half Acre" the old frame land office was removed.